I'm sure if I had a daughter, I would think this was super awesome - and don't get me wrong, while I think it's sweet - I also think it's unfair! i have seen a lot of 'daddy daughter' events but never 'mommy son' ones. 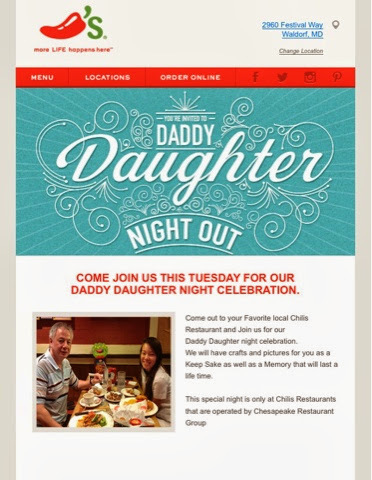 I mean, i'd like to take my boys to chilis for food and crafts - or chickfila for a date night. how come nobody thinks of the ones with only boys?!? we like fun themed date nights for just us! especially us SAHMs who need special excuses to go to dinner!!! Don't worry I get screwed too! Never any Mommy and Daughter dates! So we don't ever get to go either. Being that there are so many single parents you would think they would come up with something that fits all crowds. Sheesh!